Is Cycling Good For A Runner? He was frustrated because he generally felt very fit and never had any trouble with injuries as a cyclist. Tim Gabbett - "It's not the load that breaks the individual down. It's the load they are not prepared for." 1. Cycling, while beneficial for cardio health can contribute to muscle balances that can set you up for an injury. The Resilient Runner Workshop takes the latest evidence-based research and practical strategies to optimize your movement foundation so that you not only avoid injury, but enhance your running performance. Saturday June 2nd. 12pm - 3pm. The research is pretty clear that the biggest risk factor for an injury is a past injury. Pain and injury can trigger off protective mechanisms that can sometimes be tricky to identify and overcome. For many runners returning from an injury, a common theme is to run within yourself, intuitively trying to protect the body from further injury. The past weekend I attended Peter Malliaras's course, 'Mastering Lower Limb Tendinopathies'. Peter is an Associate Professor at Monash University and has spent many years researching and working with people with tendon problems. In recent years there has been a lot of significant new research in the world of tendon rehab. If you've ever had an issue with an ongoing tendon problem, you can understand how frustrating the long term pain and dysfunction can be. There is much conflicting advice and out dated treatment approaches that can contribute to the poor outcomes many people face with tendon injuries. Thankfully, Peter has put all of the latest based evidence into a comprehensible format and in this blog post I'd like to share just a little summary. Tendons connect the muscle to bone. They are made up primarily of collagen fibres. Tendons are like springs that absorb stretching forces and then release energy when we move. Tendons are very sensitive to changes in load. Essentially, tendons become injured when we over-load them too soon, or when demand exceeds capacity. For example a runner may start to include sprinting or hill work too soon or increase mileage suddenly leading up to a big race. High training load is not a risk for injuries, it's how you get there that is the important factor (i.e. avoiding acute spikes in training loads). What is the difference between Tendinitis and Tendinopathy? Tendinitis refers to the inflammation in the early stages of an injury. This is opposed to tendinopathy that refers to the process of degeneration that tendon goes through in response to chronic overload. Recent research suggests a lot of what we previously thought of as tendon inflammation was actually related to tendinopathy. Who is likely to suffer from a tendon problem? Usually occurs in younger people involved in jumping sports such as volleyball, basketball and football. There is some evidence to suggest pathological tendon changes can begin in early adolescence if there excess load on the maturing collagen in the tendon. Affects people across the lifespan, in particular long distance runners, sprinters, football and soccer players. Often there is pain and stiffness that is worse on waking and when running. Common in young females that are doing a lot of running or playing sport. Also older women, especially around menopause or after post a hip injury / surgery. Pain is often worse at night time, standing and walking. There is some research showing a reduction in oestrogen can pre-dispose to tendinopathy. Fast walkers, footballers, runners and people who do a lot of yoga are susceptible to hamstring tendinopathy. They often experience pain on sitting, walking and bending forwards. 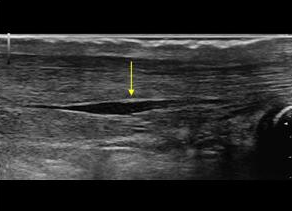 What are the key risk factors for developing tendinopathy? One of the biggest risk factors for a tendon injury is a past injury (2-19x greater risk of injury). According to the research, people with tendon problems are not getting the rehabilitation and re-building of capacity they need. Often patients self-discharge when their pain has gone away. Tendon issues are diagnosed with a combination of history and physical testing. If you have a localised pain that gets worse with movement and you can recall a sudden change in loading, there is a good chance you have a tendon problem. Ultrasound scans can be useful to confirm the diagnosis and rule out certain other conditions. The long term goal is to create greater capacity in the tissues and this is your job, under the guidance of the physiotherapist looking after you. Manual therapy and dry needling does have a role to play in the short term to decrease pain and normalise muscle tone. You may have a scary sounding ultrasound report, with words such as 'severely degenerative'. The bad news first. Your scans will most probably always look terrible. Structurally over time, there will be no change, despite what you do in terms of treatment. Many high quality research studies have shown that there is no correlation between pain and structural changes on scans. Your tendon will always be degenerated. However, the thing we do have control over is the mechanical adaptation in the tissues around the tendon, as well as optimising biomechanics and sharing the load around the body. The goal of treatment is to build the capacity in the tissues surrounding the tendon so that it meets the demand and creates a buffer zone of relaxation. "Pathology is common in people without pain, so it cannot be the cause of pain. Worse pathology does not mean it will be harder for you to get better. 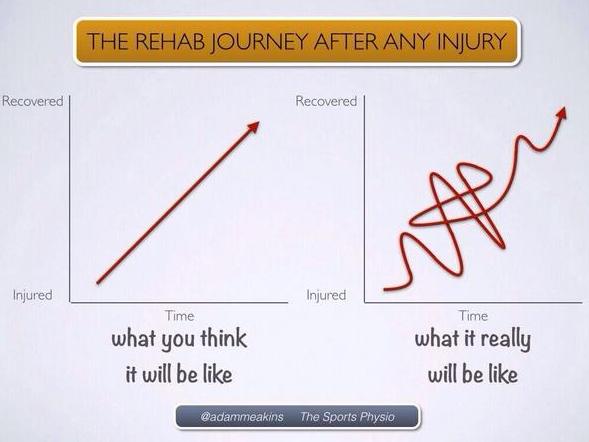 It's important to understand the nature of recovery is often a case of 2 steps forward and 1 step back pattern. It's normal for your pain levels to fluctuate. If you can accept this, while continuing with your rehab, you will have a much greater chance of success. Pain can be brought under control by managing load and using ice and NSAID's. You may need to take a short break from any aggravating activities. If you can't take anti-inflammatories you may need to look at your diet for areas to address inflammation. How can isometrics help decrease pain? Isometric refers to a static contraction of a muscle without any movement. Isometrics can decrease pain without adding excess load to the tendon. The positive research around isometrics is in it's early stages and mainly focuses around the patella tendon. 3. Assess current load capacity and tolerance then begin re-loading the tendon. 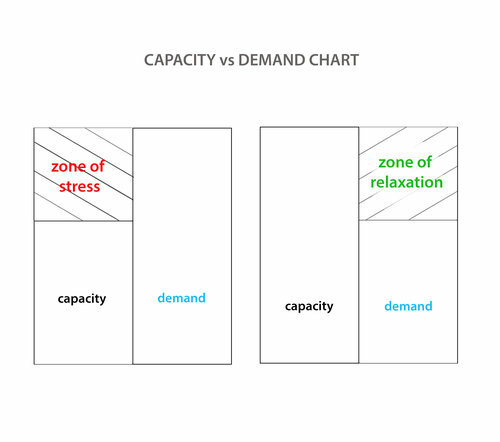 Your Physiotherapist will take you through a comprehensive load capacity assessment and then develop a re-loading strategy. This most important factor is that we progress the load over time to bring out positive adaptation and improved load tolerance. You will most likely meet with your Physio once per week in the short term to closely monitor and progress the load at a suitable rate. We will address these factors in the clinic. By optimising your movement efficiency, you will increase the likelihood of successfully returning to doing what you love and staying pain-free. This is where you get to really to push the boundaries of building capacity and gradually resume training and getting back to what you love. 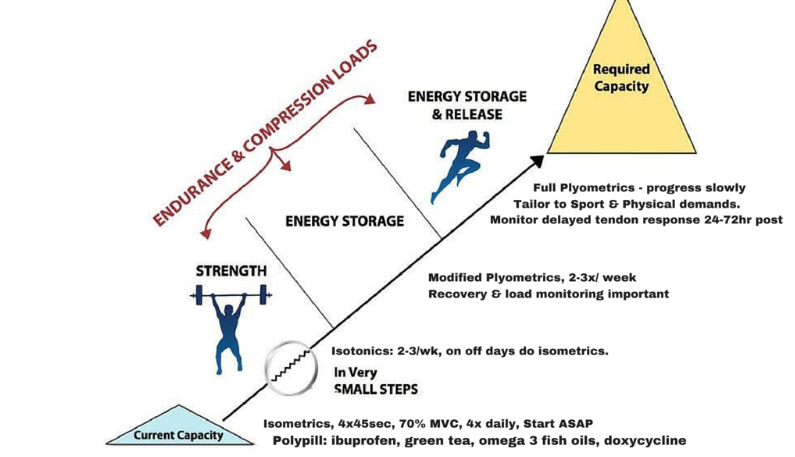 It's important at this stage to think not only about training but also proper recovery to allow the tissues to optimally adapt. You will want to optimise things like sleep, food / protein intake and foam rolling to keep your muscles tuned up. This stage may weeks / months to fine tune and this is where we will monitor you loads to ensure a successful return. Despite your ugly looking scan and long-term pain, there is good evidence to suggest you can make a good recovery and get back to doing what you enjoy. Tendons are resilient and adapt. But you need to give them time. The time-frame on average to achieve this is a minimum of 12 weeks (but continual small improvements can still occur up to 5 years later). There is a significant degree of complexity involved in a tendon problem and a Physiotherapist, after a comprehensive assessment will be able to guide you towards a positive outcome. The end game is to build your resilience and capacity to create a 'buffer' zone of relaxation. Movement capacity develops step by step. Small mindful movement of the muscle-tendon complex can improve efficiency and help ensure that your tendon issue becomes a thing of the past. This is where Pilates can be very useful. Pilates provides the perfect environment for sharpening the mind-muscle connection and also introduces elements of movement variability that help improve resilience. Steroid injections can have short term benefit but 12 months later can end up worse due to weakening of the tendon. If you have a tendon issue you would like to have assessed, I'd be honoured to help guide you. You can make a booking using our easy online system here. Sometimes injuries are a blessing in disguise. They force you to re-examine your training style and open you up to other possibilities in the way you go about doing things. Unfortunately running injuries are common and being forced into a lay off for a few weeks/months can be quite daunting. Being told you can't run can be a serious blow to a runner's sense of self. You suddenly realise how addicted you are to the physical and emotional payoffs that running brings. Most runners tell me that there is nothing else quite like the endorphin buzz that running gives you. One of the downfalls of running is that it's very repetitive and demanding on certain parts of the body that are vulnerable to overload. Common areas include: knees, hips, ITB's, achilles, calf muscles and hamstring issues. Most runners generally have very good pain thresholds. This comes as a blessing AND a curse. Niggles that are ignored over a long period of time tend do have a tendency to develop into something more serious. If you are in pain, there is a good chance your Physio will recommend taking a short break from training to allow your tissues to recover and heal properly. If you compare exercise to eating, running is like eating dessert and your foundation exercises (below) are like your main course. It's not healthy to only be eating dessert - running should be a part of wide base of 'nutritious movement'. This approach will sustain you and help you find longevity in your running career. We all know the benefits of getting in the water: the non-weight bearing movement of your body that helps decompresses the joints and allows you a full body workout without the stress of gravity wearing on your body. Try and build up to some intervals, for example 10 x 100m. This will really help optimise your breathing and cardio-respiratory performance. Even if you don't like swimming, just being in the water will be beneficial, assisting recovery. Standing in the cold water at the beach in the middle of winter is refreshing and surprisingly therapeutic. A solid kettlebell workout is the closest thing I've come to experiencing the high that matches up with a good run. Everyone should own a kettlebell or two. If you have never tried, find a good personal trainer and get them to show you the basics over a few sessions. Try swings, squats, lunges and other variations to get your body moving and re-build your capacity. Research tells us the biggest risk factor for an injury is a previous injury. Pain and injury leads to compensatory movement patterning that helps us get through the short term but isn't an ideal long term solution. Pilates help you to learn the principles of dynamic core alignment, so you will create a solid foundation that naturally leads to optimal performance in sport and life. Stronger glutes = better running and lower risk of re-injury. Stairs will also send your heart rate sky rocketing, boosting your VO2 max. get to know your running friends better - talking is easier when you're not struggling to breathe! Stressed? Angry? Let your fists do the talking. Boxing will challenge your cardio-vascular system like nothing else. Working with a trainer will quickly fine tune your power and precision and bring an intensity to your workout that may rival your running training. Try something like the 7 minute workout or ask your local personal trainer to design you a program. Add a challenge by using a foam roller or Swiss Ball to your workout. Try a combination of burpees, squats, step-ups and mountain climbers for starters. Reset your fundamental movement patterning, connect with your breathing and jump start your healing process by activating the para-sympathetic nervous system. Most runners could benefit from finding a little bit more flexibility. Restorative / yin yoga is particularly recommended for runners to keep their bodies balanced. Stand-up paddle boarding is an ideal way to strengthen your core (obliques in particular that are important for runners) and also gives your quads a nice burn. Also will improve your balance (especially if you find some fun waves to have a go at!). Minimal weight-bearing, using the elliptical machine is an nice way to get your blood and oxygen flowing. It's also an easy way to keep an eye on your heart rate and push some challenging intervals sessions...crank up the resistance! Despite it's popularity, I DON'T advise cycling as a good alternative to running as cycling strongly activates the hip flexors, and can mess up your muscle balance around your hip, knee and lower back. I would advise your to either choose cycling or running as your main form of exercise. If you are triathlete, there are some specific exercises you can do to help reduce the negative effects of cycling. You can email directly dan@kinfolkwellness.com.au and I will give you the details. What form of exercise have you found most beneficial when you can't run? I'd love to hear your thoughts below.